In August of 1985, The Banff Centre’s Leighton Artists’ Colony was formally opened by His Royal Highness Prince Philip. The studios originated as a place for senior Canadian and international artists to create new work in an exceptional environment. Artists have used the studios to create novels, poetry, plays, songs, chamber works, and operas. They have choreographed dance and music theatre, curated exhibitions and shows, and have created important visual art, films, new media, and television programming. Leighton artists contribute significantly to culture and the arts in Alberta, throughout Canada, and around the world. Some famous alumni of the Colony include: Daniel MacIvor, John Adams, Ken Lum, Jonathan Dove, Yann Martel, and Joni Mitchell. 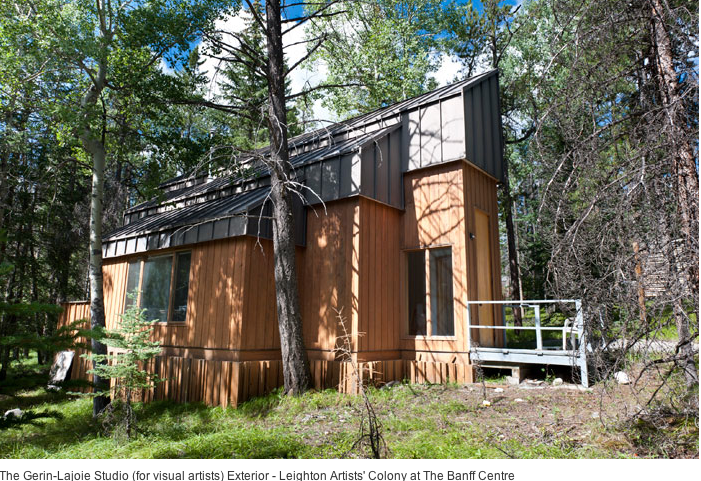 Located in a beautiful, secluded, wooded area on The Banff Centre campus, the Leighton Artists’ Colony inspires and accommodates creative practice. With its serene forest views and thoughtfully designed interiors, the Colony offers an environment that is intense and stimulating; a location free of daily pressure and distraction; an ideal space for creativity and intense productivity. The Leighton Artists’ Colony offers artists the ability to delve into their work as a solitary retreat, as well as the option to engage within the larger artistic community of The Banff Centre, which attracts over 4,000 international artists in a variety of disciplines and presents over 400 world-class performances and events each year. Eight original studios were each designed by a distinguished Canadian architect including Douglas Cardinal, Ian Davidson, Michael Evamy, Peter Hemingway, Richard Henriquez, Guy Gerin-Lajoie, Ron Thom, and Fred Valentine. Two of the studios are specifically designed for composers, and two for visual artists. All studios are equipped with a computer, printer, wireless Internet access, kitchenette, and comfortable furnishings, providing the amenities necessary for artists to immerse themselves completely in their work. In 2009, the addition of the Painter House has expanded the capacity of the studios to offer a place for a group of artists to engage in a retreat for collaborative work. The Leighton Artist Colony is named in honour of David and Peggy Leighton. David Leighton was president of The Banff Centre from 1970 to 1982. During his presidency, the Centre became a year-round, fully independent post-secondary institution and conference centre, attracting artists and business leaders from around the world. Peggy Leighton worked closely with her husband to create the personal, friendly atmosphere in which staff, faculty, and participants could be inspired.